It’s been about 15 months since those crazy kids at the Federal Trade Commission (FTC) passed their new disclosure guidelines to “protect the public” from inappropriately cozy business relationships being companies and bloggers, tweeters, Facebookers and more. Since then, we’ve been expecting a steady procession of corporate marketers being led to the virtual stockade, given that actual disclosure of business relationships in day-to-day social media reality is spotty at best. So the good news is that the FTC isn’t pummeling brands in the digital octagon like a crazed MMA fighter. But that doesn’t mean they won’t start. Furthermore, a legion of other organizations like the FDA, FINRA, SEC and other governing bodies have passed or are studying social disclosure guidelines. Thus, like driving on ice while drinking hot coffee and trying to figure out which XM station has the basketball game you want, the best practice is to be extra-cautious with this whole disclosure situation. As bit.ly has become the standard for URL shortening; Klout has become the standard for influence measuring; and Creative Commons has become the standard for digital copyrights, CMP.LY seeks to become the standard for online disclosure. And they’re well on their way. A company (let’s say my client ExactTarget) works with bloggers to spread coverage of their free new social media research. ExactTarget identifies bloggers that may be appropriate, possibly using something like BlogDash (which I love). The company sets ups a disclosure campaign with CMP.LY, stating the terms and conditions of the relationship between ExactTarget and the bloggers. 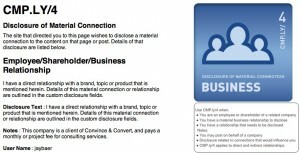 CMP.LY creates a customized disclosure Web page, a shortened URL that leads to it, and a customized campaign ID code. ExactTarget approaches the targeted bloggers and asks them to participate. For bloggers that agree, the company sends them a care package that includes a printed copy of the research, a Starbuck’s gift card, and a collection of company T-shirts and other stuff. The care package also includes a letter directing the blogger to include a CMP.LY URL in any coverage of the research via blog, Twitter, Facebook or otherwise. Bloggers log-in to CMP.LY with their campaign ID code to get their special URL for the program to use in disclosure. CMP.LY then creates a list for ExactTarget of all bloggers that have signed in, and monitors to make sure the disclosure URL is implemented. This gives ExactTarget a paper trail in case there is ever an FTC audit. There are 8 types of CMP.LY disclosures, governing most possible relationships (although CMP.LY type 0 is no relationship, so why disclose that?). 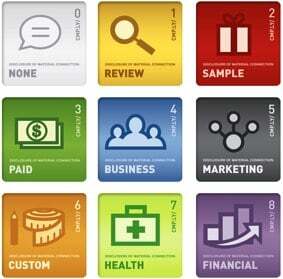 There are versions for free samples, paid posts, co-marketing, etc. There’s even a custom CMP.LY if you’ve concocted some sort of “blog posts for body parts” scheme or something. This is of course a big win for agencies and brands, as existing data for trying to determine how many times a single blog post was viewed is massively flawed. Usually, only the blogger has the real numbers and he/she typically won’t share them with the promoting company. “The real need is to document, not just disclose,” says Chernaik – who trained as a lawyer but no longer practices. Brands will also be able to create custom badges for their programs, the way they can create special badges in FourSquare and Gowalla. This is a very nice touch for large-scale outreach efforts. Recognizing that once you go beyond blogs brevity is critical, CMP.LY is also working on a “single link” solution whereby tweets and Facebook updates that merit disclosure can contain just one link (instead of the link in question + the CMP.LY link). This will be accomplished through a frame (similar to how HootSuite’s OW.LY links work). Pricing for CMP.LY is free for bloggers or other social media types that want to disclose (as I did above). For companies, fees range from $200 per campaign, per month to $1000 per campaign, per month. The sliding scale is based on customization of badges, and API access. My friend CC Chapman has been using CMP.LY for a long time, and has an interesting discussion of the system on his Managing the Gray podcast. What do you think of CMP.LY? If you’re a blogger, will you start disclosing via CMP.LY? If you represent a brand, would you pay to use this service?